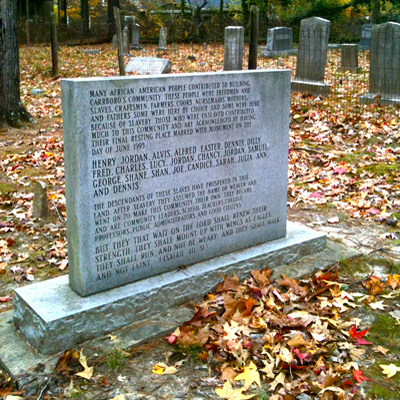 Description: The stone marker commemorates the unmarked graves of African American slaves and freedmen who contributed to the development of Carrboro and were buried in this site. The marker is composed of a rectangular granite stele atop a base of two narrow pieces of granite. The inscription includes the first names of some of those believed to be buried at the site. MANY AFRICAN-AMERICAN PEOPLE CONTRIBUTED TO BUILDING / CARRBORO'S COMMUNITY. THESE PEOPLE WERE FREEDMEN AND / SLAVES, CRAFTSMEN, FARMERS, COOKS, NURSEMAIDS, MOTHERS, / AND FATHERS. SOME WERE HERE BY CHOICE AND SOME WERE HERE / BECAUSE OF SLAVERY. THOSE WHO WERE ENSLAVED CONTRIBUTED / MUCH TO THIS COMMUNITY AND ARE ACKNOWLEDGED BY HAVING / THEIR FINAL RESTING PLACE MARKED WITH MONUMENT ON THE / DAY OF JUNE 1995. THE DESCENDANTS OF THESE SLAVES HAVE PROSPERED IN THIS / LAND AFTER SLAVERY THEY ASSUMED THE NAME OF WEAVER / AND WENT ON TO MAKE THIS COMMUNITY THEIR OWN. THEY BECAME / AND ARE COMMUNITY LEADERS, SCHOOL TEACHERS, COLLEGE / PROFESSORS, PUBLIC ADMINISTRATORS, AND GOOD CITIZENS. Location: The cemetery is located on the north side of West Main Street, between Davie Road and High Street in Carrboro. The marker sits facing the street on the north side of the street. Landscape: The marker sits just off the sidewalk in the small strip of land comprising the African American cemetery. The fenced area of the Weaver Family Cemetery sits just to the right. Shaded by mature trees, seven small, polished and inscriptionless granite blocks rest in the ground behind the inscribed marker. There are also a number of small upright field stone markers behind the marker. Both cemeteries are on a small plot amidst the residential neighborhood.